Sweater weather has finally arrived in Dallas, so as you might expect I’ve got them on the brain! Here are a selection of my favorite cozy pullovers for the season – some are embellished, others are printed – all are beautiful and will take you straight on to spring. My favorite is this one – love the length and all of the color options! It’s a cold-weather essential that I plan to wear with leather leggings all season. This sweater is another one I’m adding to my shopping cart – it looks almost identical to this one by Proenza Schouler but half the price! Great picks…I love the entire middle column! Shameful! Smile! I’m totally hooked on Equipment sweaters ever since I bought my first one last year. Love the quality and prints! I love them all. I can’t wait for it to get cool enough for sweaters here. I really want an embellished one. And the grey Topshop sweater looks so wonderfully cozy! Great picks! 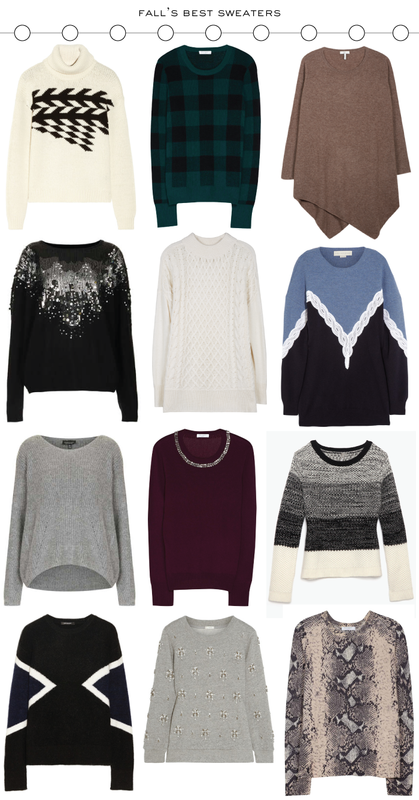 Great picks – love those Equipment sweaters!